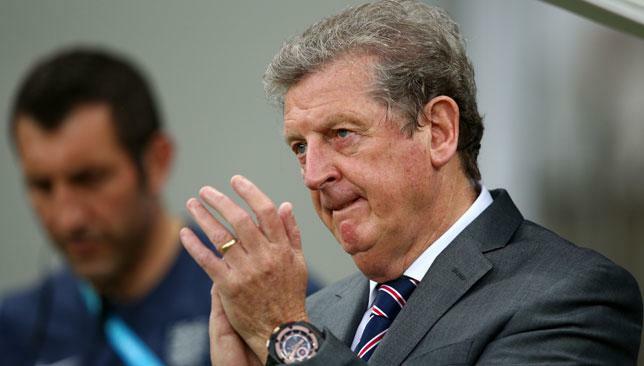 Still confident: Hodgson firmly believes his side can progress to the last 16. Roy Hodgson remains confident of qualifying for the second round of the World Cup, but accepts England may have to beat both Uruguay and Costa Rica after their opening 2-1 defeat to Italy. England produced some breathtaking attacking football, but their defence let them down in the jungle city of Manaus. The unmarked Claudio Marchisio put Italy head from 20 yards and Mario Balotelli got in behind Gary Cahill to grab a crucial second after Daniel Sturridge had equalised. Although the performance was encouraging, the reality is that England are joint bottom of Group D along with Uruguay, who surprisingly lost 3-1 to Costa Rica earlier on Saturday. England play Uruguay in Sao Paulo on Thursday before taking on Costa Rica, and Hodgson believes both games are must-win. "The fact is that if you lose the first game you probably have to win the next two," the England manager said. "The teams you play against have to win as well, but there is no way you can drift into the second round. "Italy have the best start, as have Costa Rica, and we and Uruguay are on the back foot. We now play Uruguay and Costa Rica, so at least our fate is in our hands." Hodgson was excited by what he saw from his young Lions and called on the squad to quickly move on from the loss. "We have to lift our heads now and make the players realise that if they can reproduce that performance twice more there is a good chance they will get the result," the manager said. "It's never easy to take positives when you have lost, but I think we all need time to digest what happened on the field. My gut feeling was we did some very good things and there were some good individual performances. "I thought all the young players did well. None of them let me down or their country down today." England manager Roy Hodgson defended Wayne Rooney after the Manchester United striker was unable to prevent his team from losing 2-1 to Italy in their opening World Cup match. 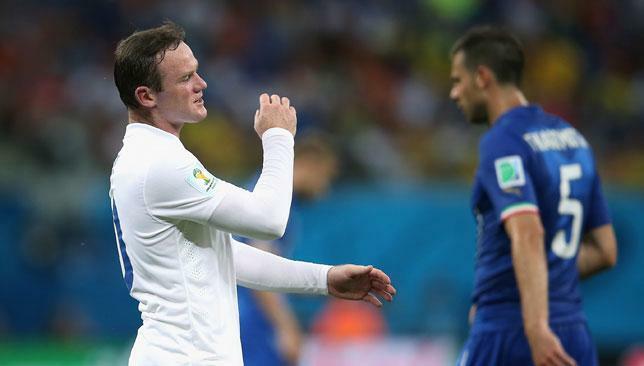 Rooney began the game in Manaus on the left flank to accommodate Raheem Sterling, and although he teed up Daniel Sturridge for England's equaliser, he occasionally left left-back Leighton Baines exposed. The 28-year-old also endured a frustrating night in front of goal, notably lashing one chance wide as England chased the game in the second half. Hodgson however said that he had performed admirably. "We wanted to get Raheem Sterling around (Andrea) Pirlo because of his agility and that meant moving Wayne Rooney, and I thought he did well," Hodgson said after the Group D encounter at a humid Amazonia Arena. "He set up the goal for us and worked hard, and did well when we moved him into the centre. "There's always going to be one player with a big debate around him, but I think it's harsh for people to criticise his performance, because for me he played well." Sturridge's goal, in the 37th minute, gave England parity after Claudio Marchisio had fired Italy in front two minutes earlier. But Mario Balotelli's header early in the second period proved decisive. Sterling played a key role in the equaliser, freeing Rooney with an incisive pass to the left flank, and was a constant source of invention in the number 10 role. The 19-year-old Liverpool forward's willingness to run at defenders sowed disarray in the Italian back-line at regular intervals, but Hodgson was reluctant to single him out for praise. "We thought all the young players did well," he said. "Sturridge had an exceptional time until he got a dead leg that forced him off; we thought Sterling was as bright as we'd hoped; (Ross) Barkley, when he came on, did some good things; Jack Wilshere showed all the right intentions; and we know what Danny Welbeck can give us. "None of those players let me down. They all did what we were hoping they'd do, except of course score that equalising goal." Two goals in two second-half minutes saw the Ivory Coast come from behind and beat Japan 2-1 in a dramatic World Cup Group C encounter. The result sees the Ivory Coast join Colombia — who beat Greece 3-0 earlier in the day — on three points atop Group C, and Sabri Lamouchi's side must face the South Americans next in Brasilia on Thursday. "We didn't start the match very well and we switched off at the goal but then we started to create chances. For us it was so important to start this World Cup positively," said Lamouchi. " Having a player like Didier Drogba in your side, whether he is starting or on the bench, changes a match. The players are delighted with the victory, but we are not through yet." 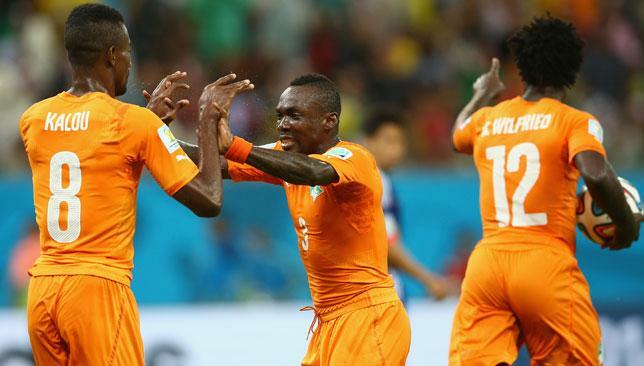 "The Ivory Coast stepped up the intensity as the game went on. Physically they are so strong, more than we are capable of being," admitted Japan coach Alberto Zaccheroni. "They are stronger than us in the penalty box so we needed to prevent the crosses from coming in. I thought we could win the game but now our backs are against the wall." Aurier, of French club Toulouse, was the source of both goals with two identical balls into the box from the right. For the equaliser, Bony connected with his head to send the ball flying past Kawashima and into the net at the far post.